ETA: EEEEK! This card made Card of the Week! As you can see, I'm still making Valentine cards for Pat's card drive for the children's hospital. Yesterday, there was a Unity challenge to make a card with hearts on it. Obviously, Jeanne was helping me in my quest to make Valentine's. :) This uses Unity's Birds of a Feather which I had not inked up yet. Crazy huh? I love this set! Speaking of love, Angela released a whole bunch of love/Valentine sets yesterday and they are fantastic! And someone very dear to me created a set! Tanis! Go to the Unity site and check them out! I think the free shipping is still going too! Also, if you've read my blog before, you know how crazy I am about Lauren Meader. But I have a confession, I have new idols. For card making, the sweet and lovely Jennifer Buck. She does clean and simple like no one's business, one day I'll be as good as her. And for scrapping the sweet and lovely Brooke Lien. I'm in love with Brooke's super fun style! awww, so sweet Ashely. I love this little bird. 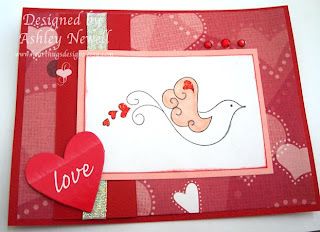 looks great with the extra hearts on the paper and embellishment. Gorgeous card Ashley! I love how you colored in this stamp!! Very pretty Ashley! Great card! Such a sweet little bird makes for a sweet little card! Ashley this card is very pretty. 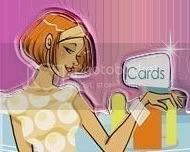 I am loving all your Cards for a Cause they are all so different from each other and such nice Eye Candy for us!!! I just got my Etsy Challenge posted. It was fun to do!!! Gorgeous cards. Love the colours and that paper is gorgeous. Thanks for mentioning me :) You're such a sweetheart!! This is beautiful! I love Fridays, don't you! Hangovers have never been such fun! Hi, Lisa from group 9 introducing myself. Great blog! Looking forward to sharing ideas! pretty stamp and lovely card. What a sweet card! I really like that bird!